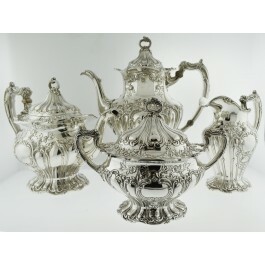 For your consideration is an Antique Dated 1903 Gorham Chantilly-Grand .925 Sterling Silver Vermeil 4 Piece Coffee Tea Set in pre-owned condition. This set features (1) 1 3/4 Pint Coffee Pot, (1) 1 1/2 Pint Tea Pot, (1) Sugar Bowl and (1) Creamer Cup with the Chantilly-Grand pattern, one of Gorham's most popular designs. The entire set shows off it's original polished finish. The coffee and tea pots have bone accents on the handles. The sugar bowl and creamer cup have a vermeil (gold plated silver) interior finish. Minor small dings appear on each piece on the areas where a monogram would be placed, however can be fixed by a competent silversmith. Total weight: 1,205 grams. Please view our photos for additional information.